Macedonia is a small country which is bounded with Greece. Teacher Almoni was telling me about her country looking through the window in her flat to the Millennium Cross on the top of the Vodno Mountain during our Skype session in online school engoo.com. 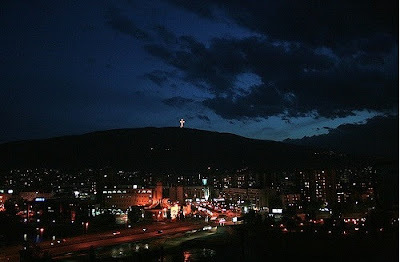 (The Millennium Cross is a 66-metre tall cross situated on the top of the Vodno Mountain in Skopje, Republic of Macedonia. It was constructed to serve as a memorial of 2,000 years of Christianity in Macedonia and the world. Wikipedia). Macedonia pronounces /ˌmæsᵻˈdoʊniə/ mas-i-doh-nee-ə. The capital city of Macedonia is Skopje. The population there is about 700 thousand people. It is quite polluted city partly because it is surrounded by mountains. Mountains in Macedonia attract tourists who like natural excursion like hiking. The majority of inhabitants speak in the Macedonian language. People in some regions speak in Albanian, Turkish, Greek, Bulgarian languages. English here is the first foreign language which everybody studies in school. Students in schools study German or French as a second foreign language. The level of life is quite low especially in the countryside where the finding job is a really difficult task. The situation in Skopje is much better. Nevertheless, Macedonia has almost free education system (annual tuition in university is about 200 euro) and free medicine. If you are going to visit Macedonia as a tourist you should visit Ohrid City. There are many other interesting places in Macedonia, let's explore it through the Internet and if you have a chance - just visit this country.